"It would have meant being gone for nine months and coming home for two days -- splitting up my family." As far as JOAN CUSACK is concerned, "What About Joan" is her dream come true, and with JAMES BROOKS and KYLE CHANDLER as part of the package, she just may be right! ENTERTAINMENT TONIGHT: How do you feel about having your own show? 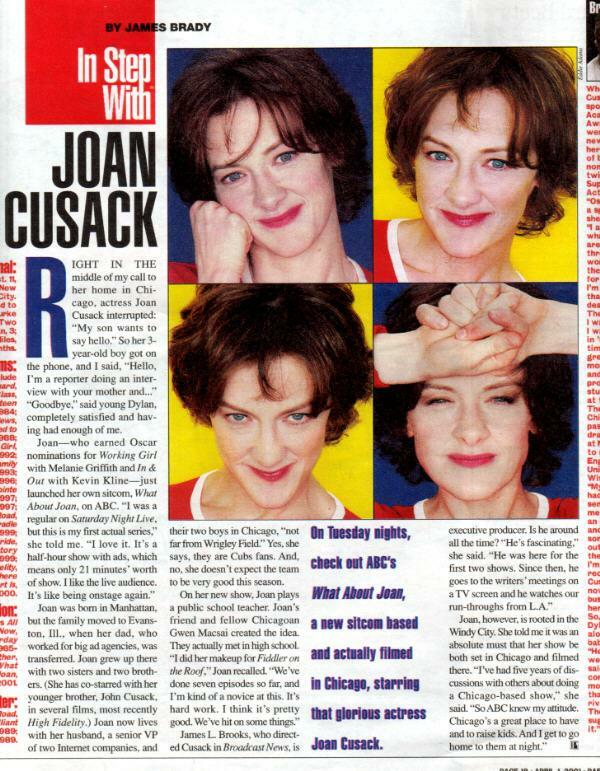 JOAN CUSACK: Oh! Well, it's my dream come true. I've been trying to do this for a while. I originally met with JIM BROOKS at least five years ago. Things didn't work out, and he said, "There's serendipity to these things," and I thought, "That's not what I want to hear, I want to do something." I knew that would allow me to work in Chicago, stay at home, have a family and have a regular life. ET: Can you tell us how it came about? JOAN: It's something that I wanted to do for a long time because the hardest part that I've found in my job, and I'm so lucky to do what I do, but the hard part is you have to travel to work, so you never live and work in the same place. So, a while ago, I really thought, "Gosh, wouldn't it be great if I could do a TV show in Chicago?" A lot of actors that I've talked to have said sitcoms are such a great life, because you really have one night that's a long night -- the night that you tape -- and the rest of the week you work more regular hours, and you have weekends and the summer off. So, that sounded great to me, because I have little ones and they so need that structure. JOAN: It's been wonderful to be in this business and be able to work, but when it becomes all-consuming, I think it loses some of its enjoyment. And it's so nice to be able to have a normal life and balance it with work that I love. So, that was my goal. And then I've just tried for a long time to try to figure out the right pieces. Five years ago, I went to Jim Brooks because I had done 'Broadcast News' with him and I said, "I'd love to be able to do a TV show." Of course, he's a legend, and he's brilliant. And he's said, "Well, we'll see." I was just so frustrated. Years later, when it was even better for me to do the show, Jim heard GWYN MAXI, who's someone that went to the same high school as me, on NPR doing comedy pieces that he really loved. He tried to develop a television show with her, and we all kind of fit together and it clicked. It's magic. It's my dream come true. ET: I imagine you have times when you can't believe it's actually happening. JOAN: It's true. It's a lot of work, and you feel like you need to figure all the things out -- how to make it smooth, and great, and fun. And that's the thing that I'm really enjoying about it, because I've done theater before and I've done film before, and this is sort of like a mixture of them. Then it's sort of like a haiku also, because it's so short. But I really love being able to play in front of an audience. That's so fun. You never get that when you do a film, and the cast is so great. It's so great to work with the same people every day and try different stuff. ET: Would you have done this show if it hadn't been set in Chicago? JOAN: Probably not, because then it would just be so disruptive to my family, and that was part of why I wanted to do it. It would have meant being gone for nine months and coming home for two days -- splitting up my family. My husband works. He has a regular job here. ET: What about the people that had to come here, and now they're missing people? JOAN: I do think about that. Everyone's an adult, and everyone is making his or her own choices. Two people in the cast are from New York, and that's not that far. It's not L.A. It's one of those things where, gosh, you hope it works, because you never know if something is going to work. So, maybe it will be an interesting job for a little while, and then maybe it won't work. You just never know. ET: How much of the city are you going to put into this? JOAN: Hopefully, as much as we can. We're using a lot of Chicago talent, so that's a lot of Chicago in there in that way. It's based in a studio, so we've got some stuff that they filmed. ET: You don't have anything going on outside? JOAN: They've shot some of that, so they can use it, and a lot of the sets are based on real places that they've filmed. But mostly, we have the heart of Chicago in the crew and the people that work here. JOAN: My sister. My sister is a writer on it. And my other sister, who actually lives in L.A., is doing the show playing my sister. ET: Is there ever going to be a big family reunion at some point on the show? JOAN: Oh! You never know. I've been in JOHN's [CUSACK] movies, so hopefully he'll be in my show, too. ET: Tell me about working with James Brooks again. He's so awesome, how did you end up connecting with him? JOAN: It's beyond a joy to work with him. He's inspirational. He's been doing this for so long and he's so good at what he does, he can see the essence of a scene, how it works and how it doesn't work. He has so much humanity in him that comes through in his thoughts and directions and what the meaning of a scene is about. ET: So, in your wildest dreams, what's going to happen to the show, and how great does it get for you? JOAN: Well, my dream is that it finds an audience, has something meaningful to say and that I get to work with amazing people here in Chicago for a long time.